If you are looking for a perfume that smells like “vintage” cosmetics then sniff no further. L’Artisan Parfumeur Drôle de Rose is a fun, fuzzy pink powder puff, a cheesecake boudoir of perfumes: sweet, powdery, with flirty florals. If you use fancy French cosmetics then I feel like you’ll find this perfume a bit boring unless you really do want to smell like your face powder! Hey, some people do! And others may long for the memory of mother, a stylish great aunt, or a best friend that rocks vintage fashions. Drôle de Rose is the vapid memory of old-fashioned cosmetics. (My opinion is that Malle Lipstick Rose is way more glamorous and gets my #1 vote for the “perfume that smells like maquillage” genre, but I’ll save that until another day). The opening is straight up Guerlain Météorites Face Powder on a powder puff, a powdery violet iris with sweet greenness. With time I get a powdery rose that reminds me of Lancôme Rouge Absolue Lipstick. It’s still heavy on the violet with a splash honeyed orange blossom water. The orange blossom water is very understated (lacking its usual “sparkle”) and mainly there as a honey carrier; it’s there drowning in the talcum. 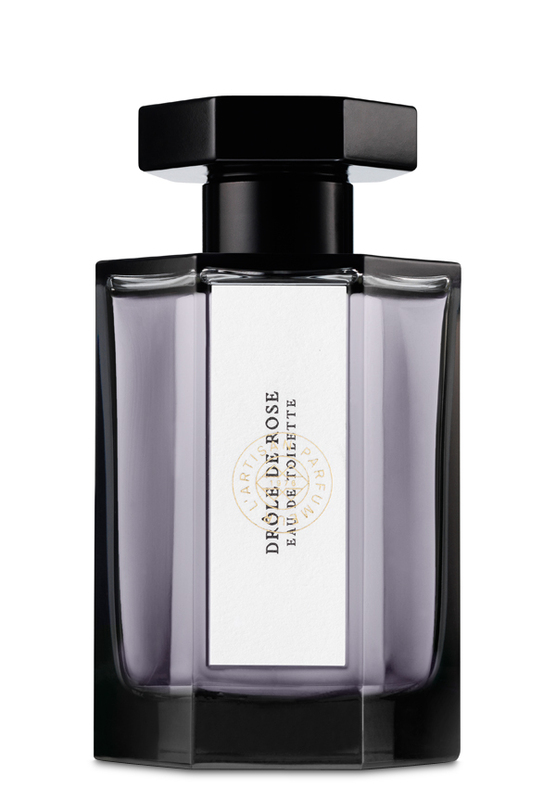 Drôle is a powdery, almond, sweet vanilla-ish floral. Think heliotrope, lots of heliotrope with violet and rose. The dry-down reminds me of Coty Airspun Face Powder and the faint traces of an unknown sample vial of a classic French rose-iris-leather EDP. All of this reminds me of the “perfume” smell that one would have left on their hands after touching many perfume samples, blotters, or perfume bottles. It’s that melange of feminine fumes. You fumeheads know it. I can see how someone would like Drôle de Rose. It’s a super feminine “dressing room” perfume. However, I wear fancy French cosmetics by Guerlain and YSL and cheap scented old-fashioned stuff from Coty and Covergirl. If you hug me, I have a feeling that I smell like this. I’d hug a friend of mine that used Lancôme and Guerlain powder foundation, powder, blush, and lipsticks. Her face smells like Drôle de Rose. And I miss her face. Notes listed include honey, aniseed, rose, orange blossom, white iris, violet, almond, and leather. Who should try Drôle de Rose? Those that want to smell like makeup and talcum powder! Or if you like perfumes like Malle Lipstick Rose, Guerlain Insolence EDT, Malle Lipstick Rose, Bulgari Rose Essentielle, Brosseau Ombre Rose, Stephanie de Saint-Aignan Le Pot Aux Roses, and/or Hilde Soliani Vecchi Rossetti. Really the lasting power isn’t too bad for this EDT. I can smell the faint perfumed powder dry-down after about 12 hours of wear. The 1.7 oz EDT retails for $95 and is available at Beautyhabit. And at that price, Drôle de Rose is much cheaper than a makeup bag filled with French cosmetics. Samples are also available for purchase. *Sample bought by me. Product picture from Lucky Scent. Carol Landis pic from Life Tinted Pink. Post contains affiliate links. Thanks! Olfactoria recently posted..Giveaway Winners Announced! Haha. And this is why I haven’t switched to unscented cosmetics! I get the Drole de Rose effect everyday! I’ve been wanting a flirty fragrance! Love the idea of this! Seems like a really fun perfume. I expected for this to be a boring rose fragrance. I really want to try this! I wouldn’t expect for their to be violet in it! I think my wife would love this.